Stress incontinence is an involuntary loss of control of urine that occurs at the same time abdominal pressure is increased as in coughing or sneezing. 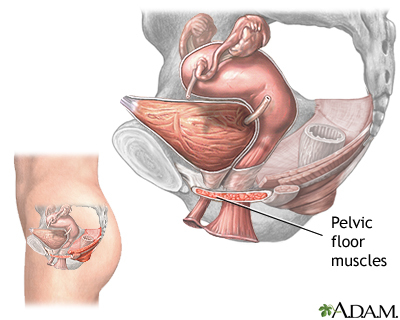 It develops when the muscles of the pelvic floor have become weak. Reviewed By: Scott Miller, MD, urologist in private practice in Atlanta, GA. Also reviewed by David Zieve, MD, MHA, Isla Ogilvie, PhD, and the A.D.A.M. Editorial team.